EVER since the 18th century, England's established church has harboured a suspicion of religious enthusiasm. Anglicanism's cosy ubiquity as a reassuring, if vestigial, presence in every English suburb and village is regarded as a defence against the sort of fanaticism that leads to social or ethnic conflict. But every so often in English church history, compromise and emollience have triggered a countervailing reaction: an upsurge in faith of a more passionate kind. Such a change may be under way now. As the number of people who are actively committed to the Church of England falls, the proportion of churchgoers who are serious about their faith-and its implications for private and public life-is growing. Peter Brierley, a collector of statistics on faith in Britain, reckons that 40% of Anglicans attend evangelical parishes these days, up from 26% in 1989. That is against a background of overall decline; he thinks the number of regular worshippers in the Church of England will have fallen to 680,000 by 2020, down from about 800,000 now and just under 1m a decade ago. The lukewarm are falling away, leaving the pews to the more fervent. A handful of big evangelically-minded parishes now exercise huge influence, far beyond their immediate patch. Saint Helen's in Bishopsgate reaches out to workers in London's financial district; it has "planted" a dozen new communities in other places, using an American model of religious expansion. Holy Trinity, Brompton has exported a charismatic brand of Christianity via the Alpha course. Meanwhile All Souls in Langham Place, which shares a neighbourhood with department stores, broadcasters and arty bohemians, radiates forth a more sober brand of evangelism. What all these churches have in common is a reluctance to do the Church of England's traditional job of marrying, baptising or burying people who have no real religious commitment. That is a break with Anglicanism's familiar role as the undemanding "default mode" of faith for a secular country. The Church of England's own number-crunchers confirm the picture of falling attendance at Sunday services in mainstream churches. They say the decline is counterbalanced by the number of people who drop into church on weekdays or are drawn in by "fresh expressions" of faith-ministries in places of work or recreation. Another bright point, they point out, is the steady number of people being ordained, around 500 each year. Of the 515 people accepted as candidates for ordination in 2010, fully 108 were under 30, up from 74 the previous year. Compare that with the Catholic church in France, which ordained only 83 priests in 2010. Yet many of the budding clerics-perhaps a third-are firm evangelicals. There is no mistaking the rising profile and confidence of training institutions like Wycliffe Hall in Oxford, a conservative evangelical outfit with strong American links; or Oak Hill in north London, where Archbishop Rowan Williams, the thoughtful, moderate head of the church, has often been denounced as a dangerous backslider. At present the archbishop's strongest challengers are liberals outraged by his compromises on women bishops and by his opposition to the government's plans to allow gay marriage. (It is now certain there will be women bishops; the question is how generously to accommodate clergy or parishes who will not submit to their authority.) But when the current generation of ordinands hit their stride, the balance may swing in a conservative direction. They are likely to give their bishops a hard time. 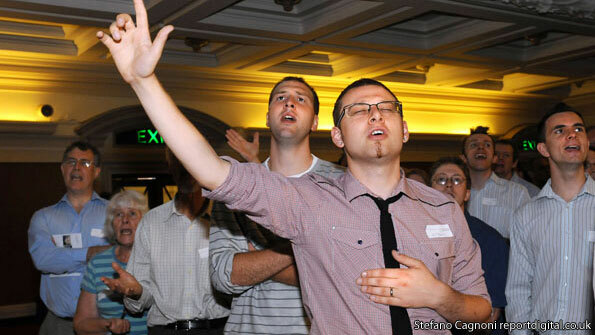 Many of the rising generation of keen young clerics already make it clear they wish to work in large evangelical churches, ripe for American-style mission, rather than in slums or charming villages where social views are relaxed and doctrinal purity is not prized. Still, as Simon Barrow, of the liberal religious think-tank Ekklesia, points out, the Anglican evangelical movement is a mixed bag. It ranges from the Alpha-course founders who are happy to deal with Catholics, Orthodox Christians and other denominations, to more sectarian types who are keener on erecting high doctrinal fences. Evangelicalism, like Anglicanism as a whole, is a fairly broad church. So powerful is the nation's resistance to "narrowness" that even religious fervour rests on compromises.